Good Choice Reading: Interview with author Emi Gayle! 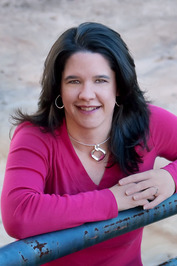 Interview with author Emi Gayle! Hi! Thanks for having me! I'm very excited to be here. Love your blog. Cartoon characters are my fav. My official bio really kinda says it all. I'm a mom of one teenager and a set of identical twin girls who will eventually be teens. Right now though, they still like me. Mostly. I've been married for forever and dated the guy I married for eternity before that. Ultimately ... a really long-long time. Obviously, my book is launching but what's not obvious is that this is my debut and it's a trilogy! Every time I get to say that, I *squee*. What else? Oh ... I have two cats and two guinea pigs, I have a real job that pays the bills, but writing is too much fun to just be a hobby, so here I am! Describe AFTER DARK in six words. Only six? Wow. That's a toughie. Funny. Dangerous. Thought-provoking (at least for Mac). Romantic (we're only at the beginning of their relationship). Motivational. Magical. Tell three things about your main character, Mac, that readers do not know. Hmmm ... that might be a little hard without giving away spoilers for the future two books ... but let's see. 1) Mac has never worn a pair of sneakers. Ever. 2) Mac was actually a very happy-go-lucky child who loved going to the library. 3) The first supernatural form Mac ever changed into on her own was a demon. (Someone should have made note when that happened ;) ). If you could jump into ONE scene in your book, which scene would you choose? And why? 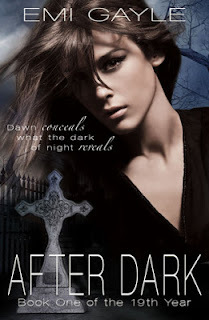 Can you share a small teaser of AFTER DARK with our followers? Endless screams. Maniacal laughter. The scent of prey. Chills raced up my spine. I wanted to run. To hide. To bury my head in the grave beneath me. Instead, I balanced on top of Samuel L. Wilson, someone’s ‘beloved father and son resting in peace,’ craving solitude and stressing like a vampire on a blood fast. Good ole ‘Sam’ decomposed underneath the largest oak in Primrose Cemetery—a spot no human would visit at night except on Halloween. A night that should have been mine. A gust of wind pushed my sketchpad to my knees, flung hair against my cheeks and sent my colored pencils tumbling. Wind, I could deal with. Humans? I’d rather not have had to. A swipe of my hand through the air brought the drawing tools back up. I yanked my hair into a tail, twisted the strands around a Cerulean blue pencil and stabbed random colors into the knot for safe keeping. My frustration with human-kind had reached its pinnacle hours before but ratcheted even higher as someone rattled the gates, girls giggled and dares to enter the cemetery from crackly-voiced, chicken boys reached me. The sharp end of something way larger than a pencil pierced my neck. I straightened with one intake of breath, dropping the yellow, number-two from my fingertips. My hand reached toward the uninvited object as I seethed between clenched teeth. “Hello, Mackenzie.” His deep bass resonated with the confidence of his kind: the not-human variety. “You’ve got to be kidding.” Whatever the tool, it pressed deeper into my flesh, and I itched to free myself from its penetrating hold. “Only because you came up behind me.” A small orb of sunlight formed in the palm of my hand as I kept my neck as still as possible. With one toss, it zipped into the air above my head. A pierced squeal emanated from behind me, and the point slid away. Holy hell, that hurt! I jumped to the ground, somersaulted between Matilda Jane, Johann Rowe and the plastic flowers that lay between them. With another roll, James Peak’s extra large headstone concealed my entire form. “Come out, come out, wherever you are.” The crunch of branches under footsteps gave his position away. With a deep inhale, my body began its shift into a new form. My incisors elongated. Heart stopped. Eyes burned. On the exhale, strength, cunning and innate wit filled me, matching that of my attacker. Thank you so much for having me and being a part of my tour! This is very different from what I normally see out here to read. I like that she's a real changeling but feel for her having to give it up and become one. Thank you for the post.